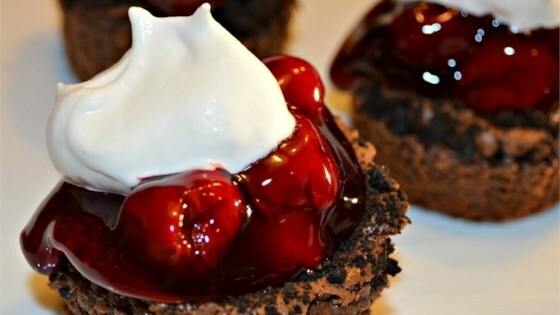 "A Yuletide treat, these easy mini-cheesecakes combine the perfect match of chocolate and cherries." Preheat oven to 325 degrees F (160 degrees C). Line muffin cups with paper or foil muffin liners. Remove cookie top from each sandwich cookie; crush and set aside. Place cream-topped cookies in lined muffin cups, cream side up. Beat cream cheese, sugar, baking cocoa, and vanilla extract with an electric mixer in a large bowl until fluffy. Mix in eggs until blended. Fill prepared muffin cups 3/4 full; sprinkle 1/4 cup reserved cookie crumbs over top. Discard remaining crumbs or save for another use. Bake in preheated oven until set, 20 to 25 minutes. Cool completely; cover and refrigerate for at least 2 hours. The perfect yuletide treat that combines cherries and chocolate! I was expecting a cheesecake, but I got these delicous things instead. Yum! This was so great. I added some instant coffee for an espresso variety. Awesome recipe! Just wondering how some others got every single one to be the perfect size all of them even. Do you use a scooper or a spoon? So easy and so yummy! This dessert is great anytime of year. I used extra dark chocolate cocoa powder. It made 12 cupcake sized cheesecakes. I will definitely make this again!